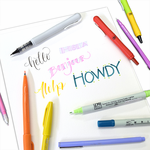 Elmers Painters acrylic paint markers make decorating easy and fun! Available in various tip sizes, and a large variety of opaque colors! They work on practically any surface including: Wood, Pottery, Glass, Metal, Paper, Plastic, Fabrics, and Ceramics. Elmers Painters are Non-Toxic and Acid-Free. And try Elmers Foam Board- great for creating signs, presentations, and displays!